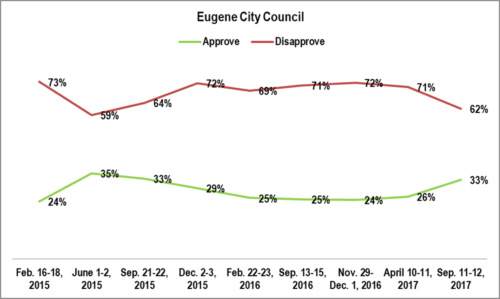 The job performance rating of the Eugene City Council improved significantly this year, though is still far underwater and is only at the levels last seen in 2015. 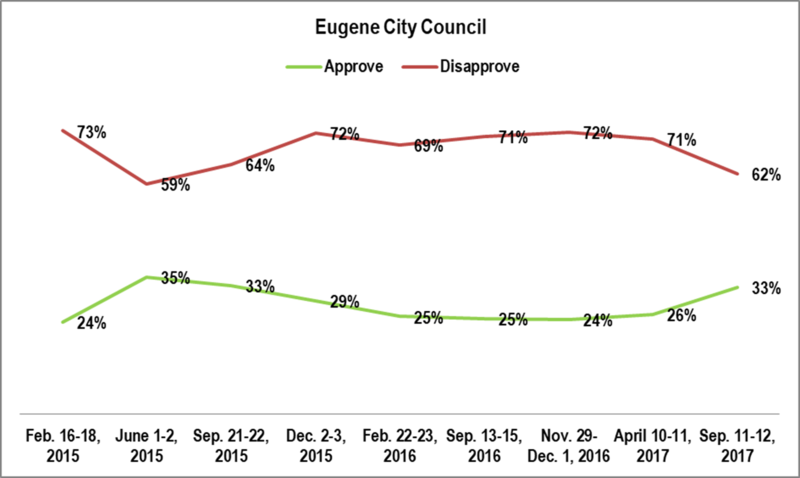 METHODOLOGY: 200 live telephone interviews of City of Eugene likely General Election voters were conducted each of February 16-18, 2015, June 1-2, 2015, September 21-22, 2015, December 2-3, 2015, February 22-23, 2016, September 13-15, 2016, November 29-December 1, 2016, April 10-11, 2017, and September 11-12, 2017. 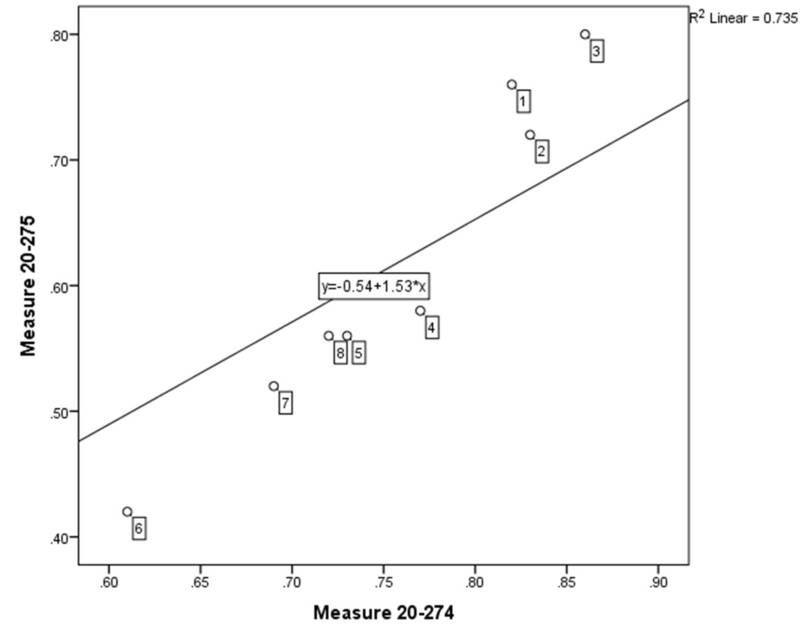 The margin of error at the sample median for each is 7%. 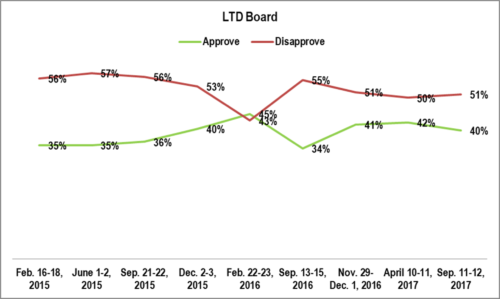 The job performance rating of the Lane Transit District Board has stayed level this year. 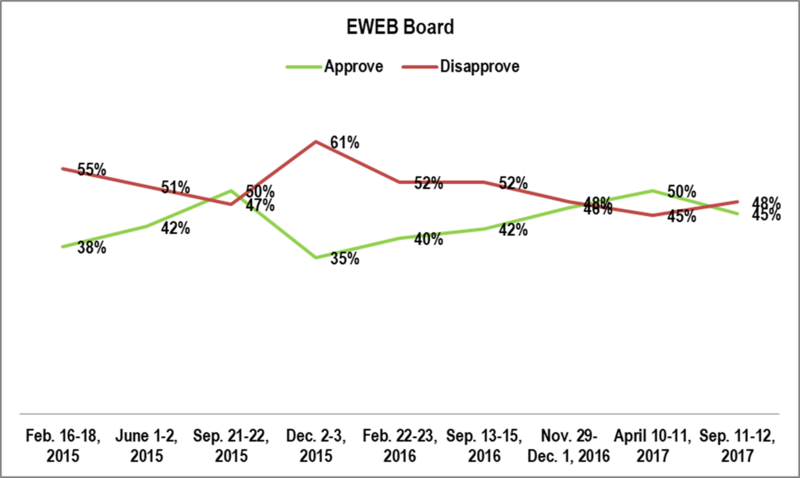 The EWEB Board’s rating continues to hover around 50 approve and 50 disapprove, but this is a clear recovery from the low ratings of 2015. 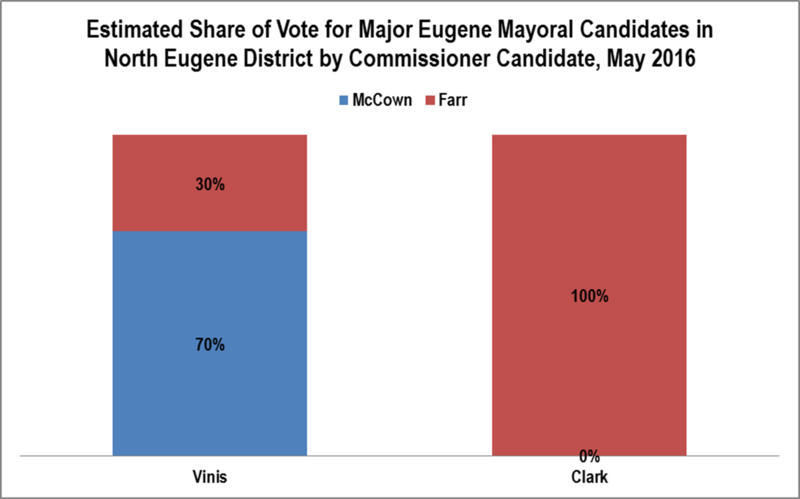 Often Eugene elections are seen as contests between Pro-Business and Progressive candidates. This implies the two sides can be analyzed as if they were two political parties. Estimates were independently prepared based on polling and precinct data. 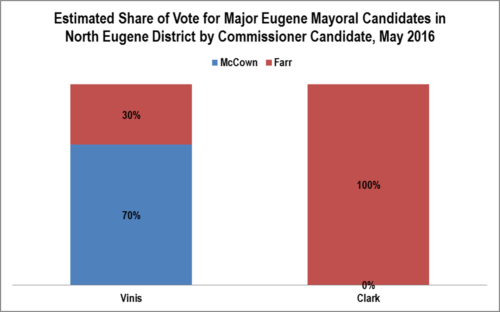 Both approaches indicate that 30 percent of Lucy Vinis’ (Progressive) vote in the North Eugene County Commissioner District had just voted for Pat Farr (Pro-Business). This direction of vote switching is even more dramatic when one considers that the North Eugene district is more pro-business than the city as a whole. Mike Clark should have been running to the left, not right, of Pat Farr. The level of vote switching observed here provides at least a partial explanation of the Vinis landslide. 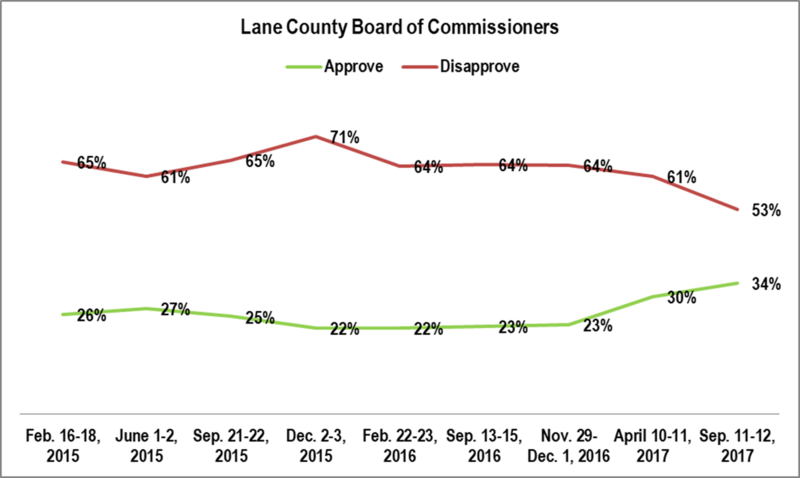 SOURCES OF DATA: Lane County Elections for precinct returns; Lindholm Research for Farr campaign tracking polls. 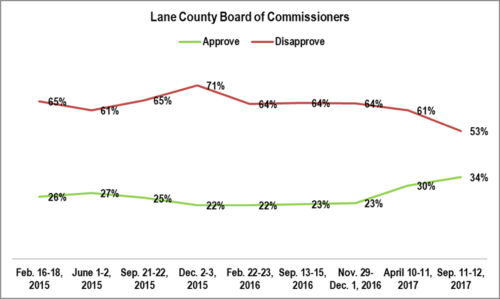 The job performance rating of the Lane Board of Commissioners has steadily risen in Eugene during 2017 and is now at its highest point in years. 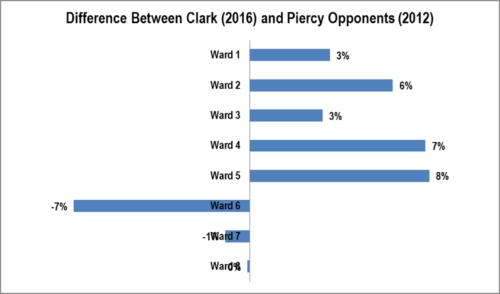 Mike Clark received the same percentage citywide in May 2016 as Kitty Piercy’s two challengers did in May 2012. This disguises some significant variations. First, Clark did much better in North Eugene (wards 4 and 5) and the South Hills (Ward 2). On the other hand, Clark did worse in West Eugene (wards 6, 7 and 8). That performance gap was worst in Ward 6 (Greg Evans’ ward and Pat Farr’s former ward). 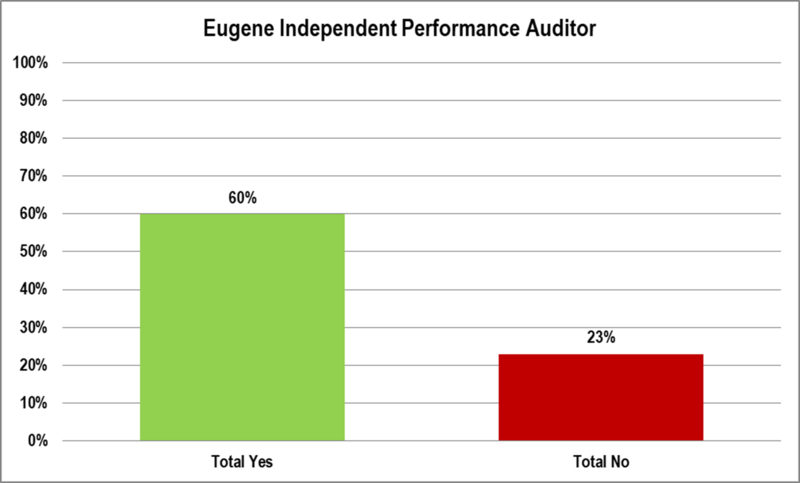 The elected auditor is supported by a wide margin. 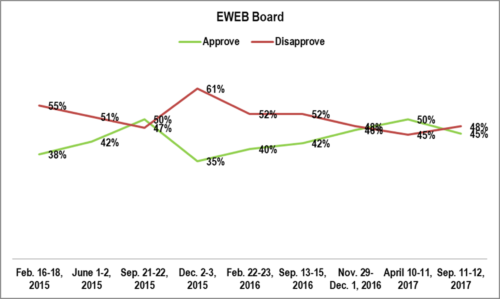 However, voter opinions on non-money measures typically are less firm than on money measures. The dramatic movement of the housekeeping charter amendment at the recently completed election is proof of that (http://lindholmcompanyblog.com/?p=14379). 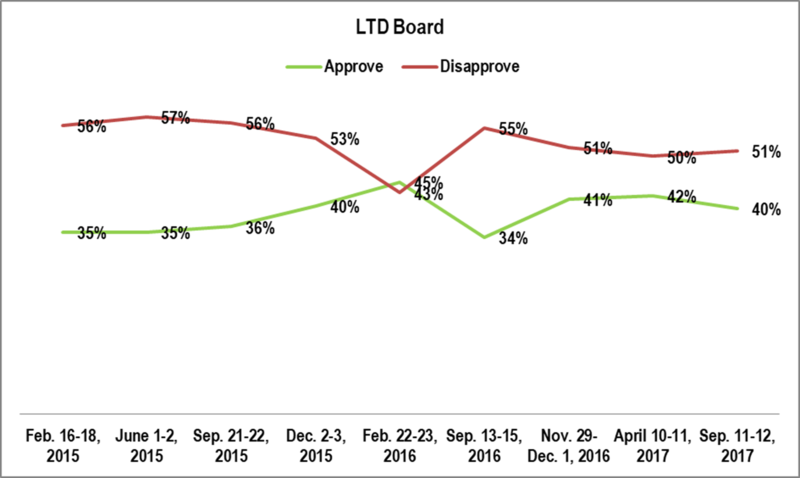 At 60% it’s level of support is not quite enough to be guaranteed victory against a concerted opposition campaign. Supporters would like to have around 70%. QUESTION: Would you vote yes or no on: Shall the City of Eugene Charter be amended to establish office of elected City Auditor to independently audit city operations and activities? 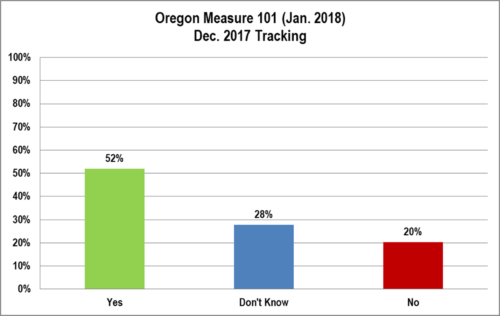 METHODOLOGY: 200 live telephone interviews of likely City of Eugene 2018 General Election voters conducted September 11-12, 2017. 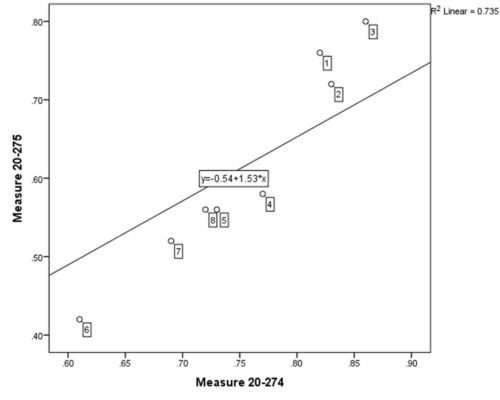 Margin of error at the sample median is plus or minus 7%. This analysis presupposes a linear relationship between the votes for 20-274 and 20-275. What is interesting is that the three southern wards are above the line, indicating disproportionate support for the streets bond measure, and the five northern and western wards are below the line, indicating disproportionate opposition for that same measure. Once again, voting returns show the gap between the three South Eugene wards, where Mayor Vinis and former Mayor Piercy ran best, and the rest of Eugene.